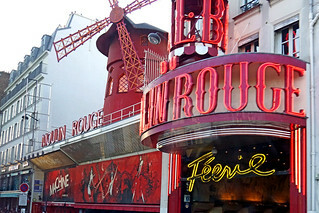 Moulin Rouge's amazing show with its famous French Cancan. The show also has about a thousand costumes all festooned with feathers, sequins and glitter, and made in the most famous Parisian workshops. After reading the reviews I decided not to go there that night, I have seen similar shows in other places. The cost for approx. two hours is $250, some people that went really loved it so if you have never been to a similar show then go. You are not allowed to take pictures inside, another reason I did not go.